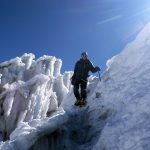 This is part 1 in a series of posts about our Chimborazo sea to summit adventure. See here for part 2 and part 3. Cycling is so much easier when you are carrying no weight and there are no hills. That was the thought going through my mind at 10.30 on the first morning of our Chimborazo sea to summit challenge. It was a challenge that terrified me, particularly after my total exhaustion on the North Coast 500 a month earlier. 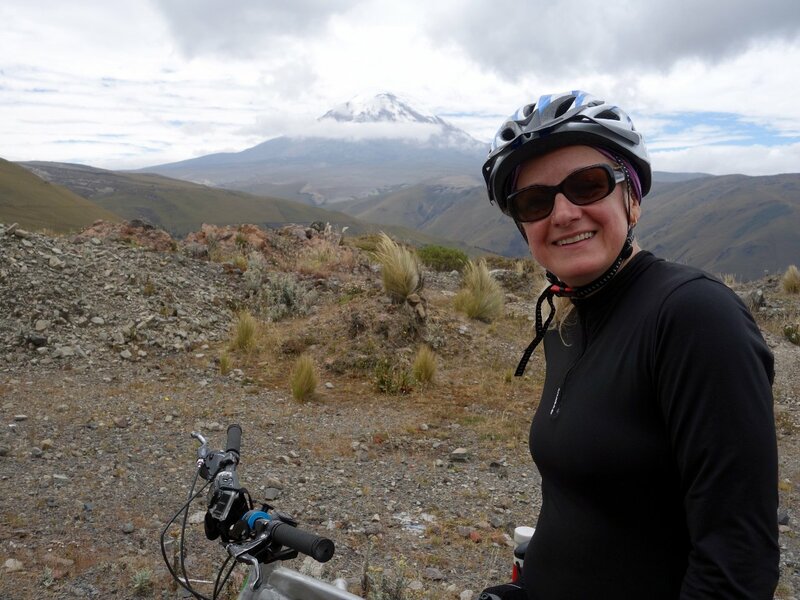 If I was that tired pedalling around the coast of Scotland, how on earth was I going to cope cycling up to 4,000m in the Andes? Preparing to depart from Quito with our bikes and bags all packed. The smile didn’t last long (Photo: Edita Nichols). 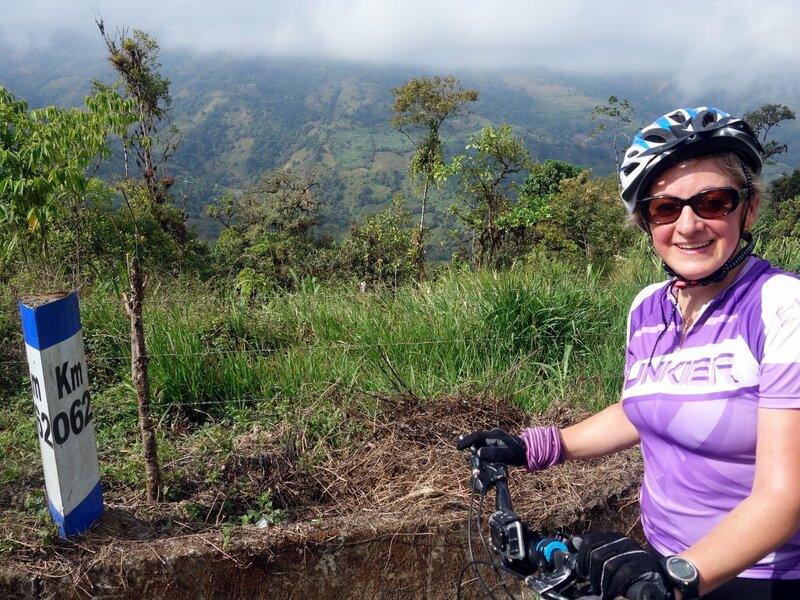 The day before we started, we drove from Quito in Ecuador’s central highlands to Guayaquil on the coast, where we would be starting our cycle ride. We drove along the route we would be taking on our bikes. It helped with our planning, but above all it helped to settle my nerves. We realised that in the mountains shortcuts aren’t necessarily a good thing. One road that looked promising on the map turned out to be horrendous. It descended 2,000m over a distance of 20km. Imagine cycling up it – 2,000 vertical metres at an average gradient of 10%! I didn’t have a hope in hell of doing that. We crossed it off our route and chose the longer and gentler climb instead. On the other hand, the last 100km – which would be the first 100km of our bike ride – were completely flat. Completely. We never had anything like that in Scotland. The roads even had a wide cycle lane for much of their length. It gave me confidence. Edita was so bullish, she suggested we could even complete those 100km by lunch. Guayaquil is a coastal city of about 3.5 million people that straddles the mouth of the Guayas River. River is a loose term though. The Guayas is so wide it’s more like a harbour. We decided to start our journey at the point where the harbour divides into two smaller rivers, the Daule and the Babahoyo. Two enormous bridges cross at the fork, and we started at sea level on the east bank of the Babahoyo River. 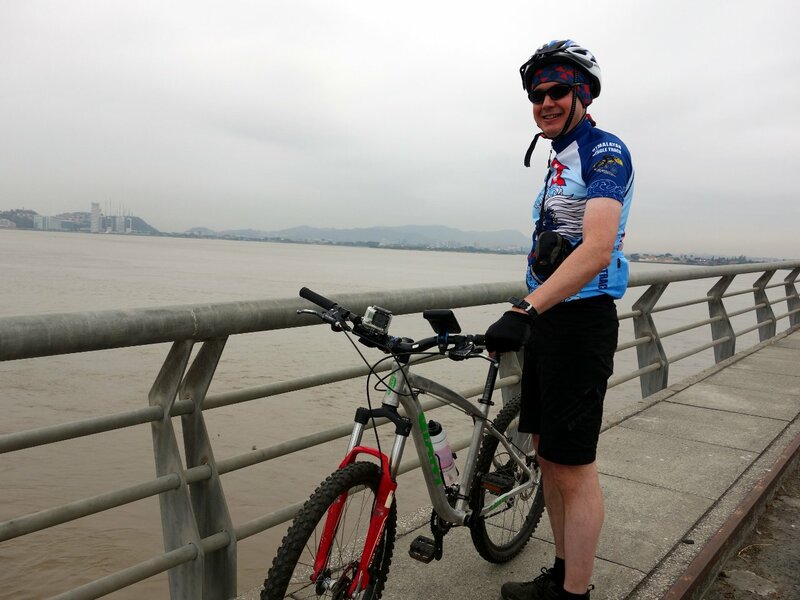 The starting point of our challenge – the Babahoyo River bridge with Guayaquil behind. I was worried about cycling through a city of 3.5 million people, and was relieved to discover that from the bridge there was only a short section of five-lane highway to navigate before we joined a smaller road with a cycle lane on the outskirts of the city. From here the cycling looked more straightforward until we reached the mountains. The first day of our ride went better than I ever could have hoped. We started early, hoping the traffic would be calmer. 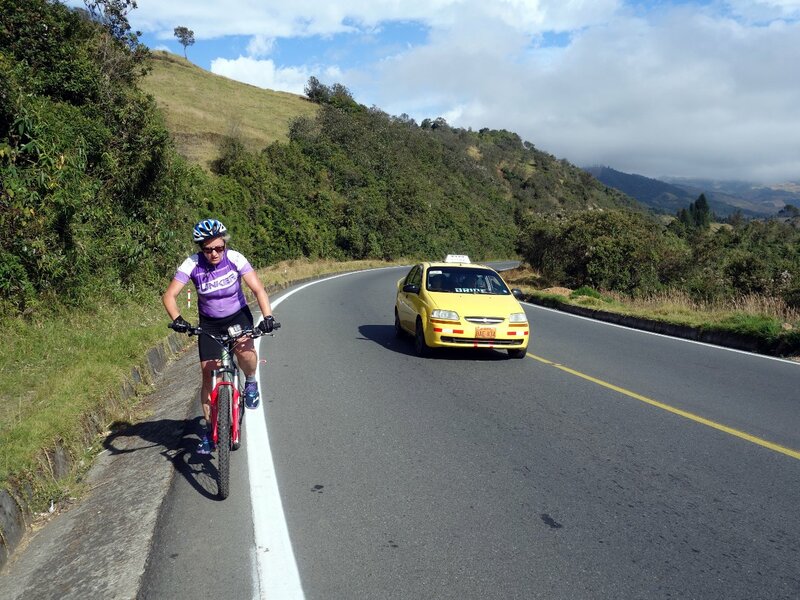 Pablo Montalvo, our support driver, is an experienced cyclist, who cycled his own sea to summit on Cotopaxi a few years ago. Pablo is the cousin of Javier Herrera of Andeanface, who organised the logistics for our expedition. Javier represented Ecuador in cycling at the Pan-American Games in his youth, and even won a gold medal. Since then, while Javier’s career has led him into mountaineering, Pablo has remained a cyclist. We were very lucky to have Pablo looking after two novices like ourselves. He parked up in a lay-by just beyond the second bridge and helped us to adjust the saddles on our bikes to a comfortable position. Edita and I rode up onto the bridge to take photos across the harbour, and at 7am we cast off into the traffic. The road was busy, even at that time, but I was relieved to discover that navigating the five-lane highway was not as traumatic as I feared. Drivers were generally respectful. They were aware of our presence and left us plenty of room. Within 5km of setting off we were able to turn off the highway onto a quieter single-lane road to Babahoyo. 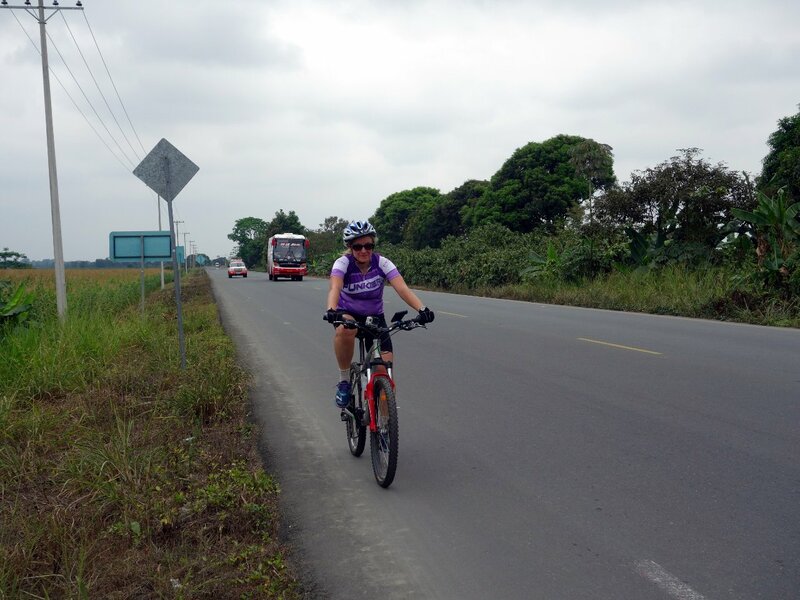 It had a wide cycle lane and the next 60km to Babahoyo were uneventful, as we passed through miles of level flood plains lined with rice fields and banana plantations. Kilometre signposts by the side of the road allowed us to monitor our progress. We passed many electronic speed checkers that clocked us variously at 28, 34, 24 and 27 kmh. Every so often Pablo drove past in his Toyota Land Cruiser, and we stopped to eat snacks and replenish our water bottles. Edita’s prediction proved accurate. We passed through Babahoyo at 10.30, where homes were built on stilts to protect them from the flooding that must be a common occurrence. By 12.30 we had reached Montalvo, the town at the foot of the Andes that bore Pablo’s name. We had cycled 100km in a morning and made such good time that Pablo was nowhere to be seen, still waiting for us in Babahoyo. We had lunch of a big chicken leg in soup, followed by a plate of meat and rice, a meal I was to discover was the standard dish in every restaurant. I was tired from the morning ride and my limbs were sore, but as soon as I got back on the bike things were OK. You will also be pleased to know that my buttocks weren’t nearly as sore as they had been in Scotland. I won’t go into the details of how I achieved this remarkable turnaround, in case you’re eating, but you can find more details in this post here. We left at 2pm to start our climb up into the Andes. The road was steep, at a gradient that would have killed me in Scotland, but on a bike with more gears, with stronger legs, and above all without the weighty panniers that we carried with us in Scotland, the climbing was so much easier. We had contrasting styles. I was able to find a rhythm where I could keep rotating the pedals slowly. Edita pedalled more frantically in a lower gear, but we moved at the same speed, albeit sweating profusely in the heat and humidity. Pablo told us that Edita’s technique is the one used by Chris Froome while his rivals are seen to pedal like me, so you can draw your own conclusions from that. In the morning we cycled across flooded plains, but as soon as we entered the mountains we found ourselves in thick forest. By 4 o’clock we had reached the town of Balzapamba, having covered 114km in the day and climbed 720m. It could not have gone better, and I was bristling with confidence. We checked into a very basic hotel that was only a slight improvement on a Nepalese teahouse. I had to stick my hand into the cistern to flush the toilet, but we didn’t care. The town sprawled along a steep hill, and although Edita wanted to walk down to the restaurant at the bottom of town, I persuaded her that allowing Pablo to drive us wouldn’t be considered cheating. I could barely keep my eyes open as we saw off our big chicken legs in soup followed by meat with rice, and I slept well that night. I had identified the second day as the crux of our cycle ride, with its 70km and 1900m of ascent, but I started the day confident we could make it. 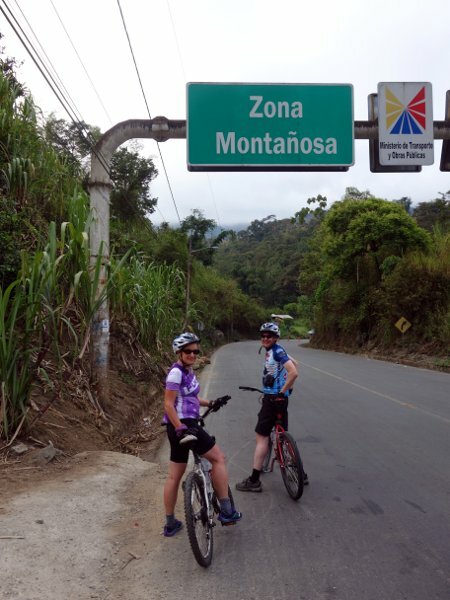 At the top of Balzapamba we cycled underneath a big green sign across the road saying Zona Montañosa. The sign wasn’t joking. For the rest of the morning we did nothing but climb slowly on zigzags through cloud forest, stopping only occasionally when Pablo drove past in the jeep. By midday we had climbed a full 1,500m to 2,200m, but the horizontal distance was more concerning. We’d covered only 22 of the 70km, and we had until 6 o’clock before darkness descended. We had lunch of – guess what – big chicken leg in soup followed by meat with rice, hoping that the afternoon’s ride was going to be flatter. Unfortunately it wasn’t. There was lots of undulation, with long climbs, followed by big descents. It was frustrating. At one roadside stop Pablo even asked us if we were carrying head torches. I was already concerned about having to complete the day’s ride in darkness when Edita started to have gear issues. She would be peddling along happily, but when she changed down, the gears skipped and the pedals swung into her. This happened too frequently for comfort. It was the first time ever – on mountain or bike – that I found myself having an easier time of it than she was. There was more role reversal when she started swearing like a trooper. 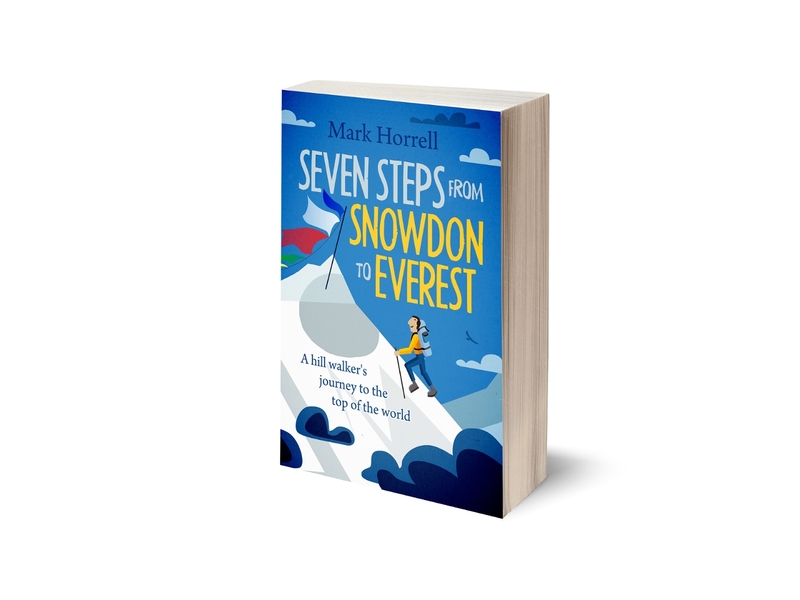 More remarkable still was that I appeared to be having a good day, gliding up the hills comparatively effortlessly. By the skin of our teeth, we made it to Guaranda just as dusk was falling. The undulations in the road had meant that there were many more than 1900m of ascent, closer to 2,600m in fact, including one 500m downhill section into San Miguel where we whizzed down 5km in just 10 minutes. Guaranda was an uninspiring town on a hillside, though it did have a palm-lined square with a nice pizza restaurant in the corner. Bored of the soup and rice, I ordered every topping on the menu and wolfed down a delicious pizza. Edita’s gears were a concern, but it had been a positive day from my own point of view. With a good bike and no luggage on the back, I seemed to have discovered a gift for climbing that I never knew I had. We had a rest day to recover, and I no longer had any fear about the rest of the bike ride. I woke up in the middle of the night with the taste vomit in my mouth. It was a difficult night, brought abruptly to an end at 6am when I had to rush to toilet for a bout of simultaneous diarrhoea and vomiting. This is a difficult procedure that’s one of the best examples of a dilemma I can think of. Happily the bathroom in our hotel was the size of a broom cupboard, which meant I was able to lean over and aim projectiles into the shower for the more pleasant of the two tasks. Bits of onion and red pepper from last night’s pizza revealed as starkly as possible that I may have had food poisoning. I spent most of our rest day confined to our room, and by the evening I was feeling only marginally better. Food poisoning is usually over in 24 hours, but I was soon to discover that when you’re pushing your body to the limits it can last a great deal longer. 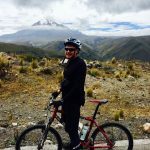 I had been feeling confident about the third day of our cycle ride to Riobamba, beneath the flanks of Chimborazo, but that was all gone as we set out from Guaranda. 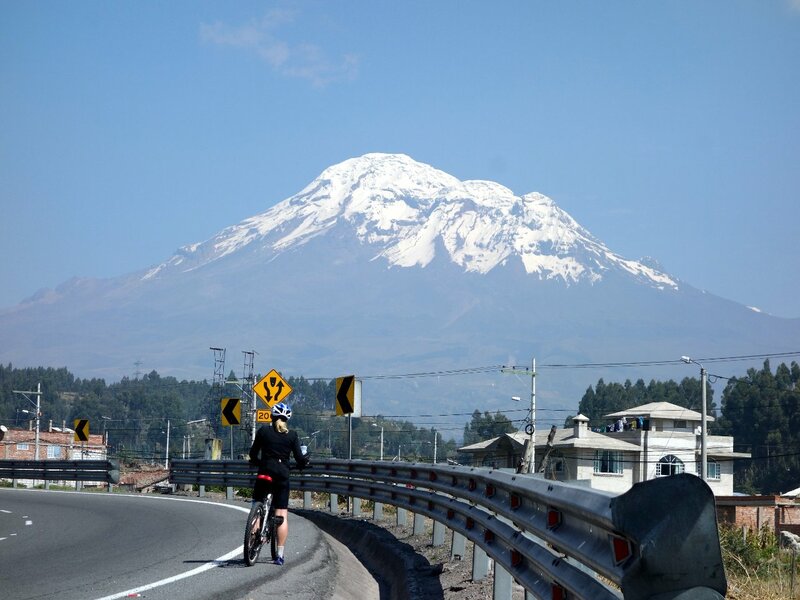 We had a total of 85km to cover, but the crucial section was the initial climb up to Chimborazo. For this part we needed to climb 1,700m over the space of 30km, all the way up to 4,300m. 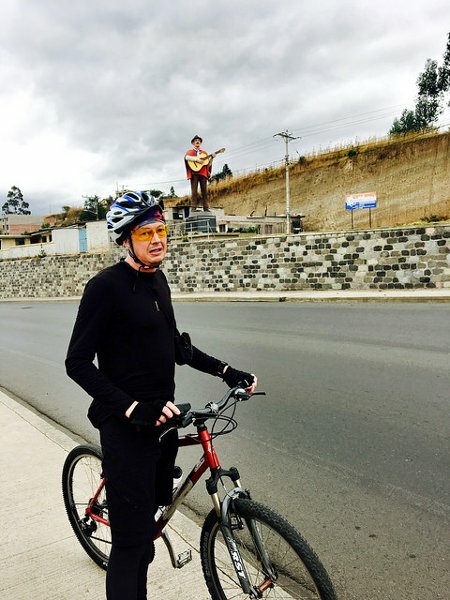 After that it would be mostly downhill again to Riobamba. I was weak and nauseous as we left Guaranda, and the traffic fumes compounded my problems. Buses drew up in front of me and belched out black smoke. Once we left town and began to climb in the fresh mountain air things were better, but they were never easy. Even so, we made good time. By 10.30 we had climbed 1,000m. But the previous day I had eaten very little, and even today I was only able to force down small amounts of simple food such as bananas, tangerines and crackers. It wasn’t enough, and I was becoming increasingly weak. Had it not been for the food poisoning, this would have been a fantastic day. 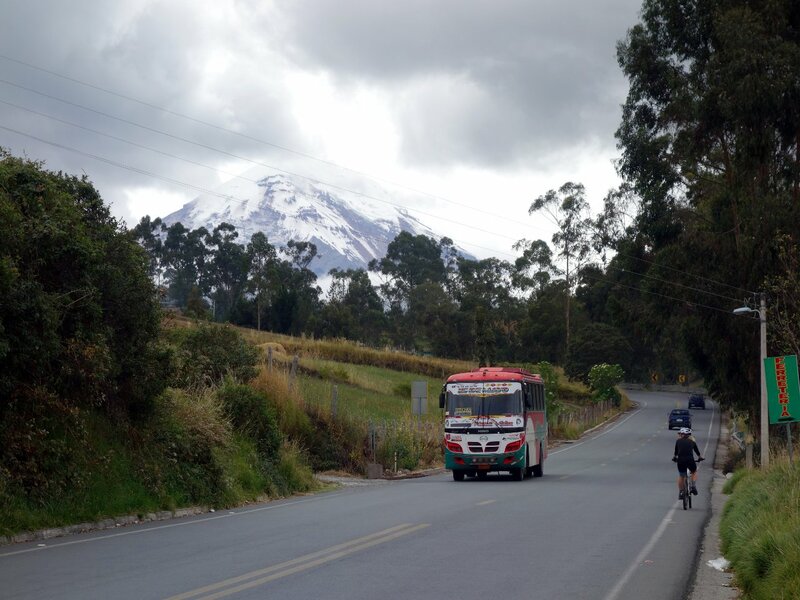 Chimborazo was in view to our right all the way from Guaranda, as we made our way slowly through the climate zones from cloud forest to high-altitude desert. It was a good smooth road, and motorists beeped their horns and gave the thumbs up to encourage us along. But I didn’t realise how close I was to exhaustion. The road flattened out as we reached the plateau that skirts the flanks of Chimborazo on its western side. Pablo was waiting at a restaurant near the turn-off to Chimborazo park gate. The restaurant was closed, so I spent an hour slumped exhausted in the passenger seat of the jeep, trying to force down food and sleep. Little by little I managed another 4km after lunch, but every few hundred metres I had to stop and flop against the handlebars. The landscape was desolate as I crawled along straight sections of featureless road. It was no good. I got off my bike and lay on my back at the side of the road, like I did in Scotland. This time it felt different. It was too cold for Edita to wait for me, so she continued cycling. I knew it was the end. A combination of nausea, diarrhoea, altitude, and a complete lack of energy meant that I couldn’t go a wheel further. Pablo was disappointed when he picked me up in the support vehicle. We overtook Edita and waited for her at the Chimborazo park gate, the top of the climb, where there was a restaurant (also closed) and a public toilet. Any thoughts I may have harboured about getting back on my bike and cycling down the hill were dashed when I got out of the jeep to rush to the toilet. I say ‘rush’, but I could barely walk. I limped to the toilet and spent about half an hour there, shivering bitterly. 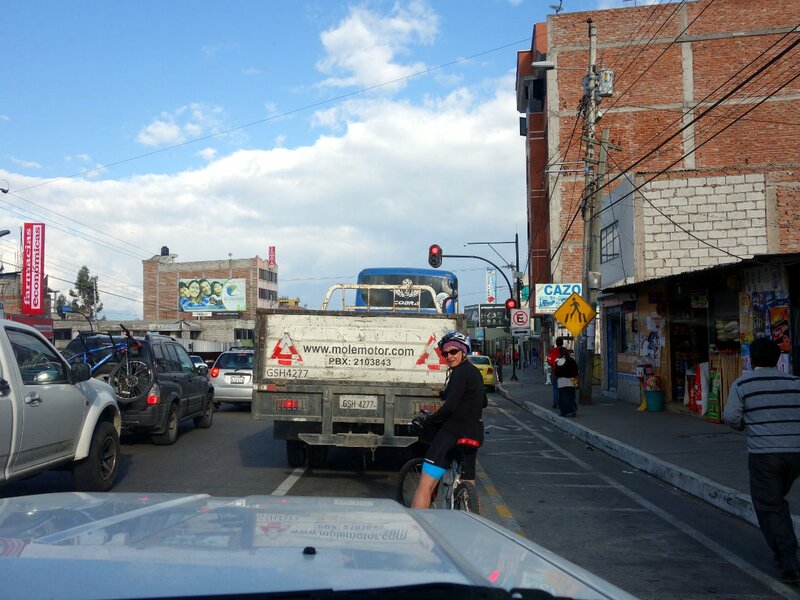 It may be downhill, but we still had another 40km to Riobamba. I knew there was no way in the world I was going to make it. I needed time to recover, so that I could at least enjoy the rest of the trip. The sea to summit challenge was over for me; I was about to cheat by getting in the jeep. For Edita it was very much still on. Although Pablo had not been able to fix the gears on her bike, he had identified that only two of them were skipping. The gear system meant that she could do without them if she remembered not to use them. At first she was mad at me when I told her that I couldn’t continue to Riobamba, but Pablo had seen me struggling across the car park, and he convinced her that it was better for me to rest. For the rest of the afternoon she was unstoppable as she raced down the hill to Riobamba. Even in the jeep we could barely keep up with her. Occasionally we overtook and continued down the road. Each time I would ask Pablo to slow down and wait for her, and he would tell me that he could see her hurtling behind us in the wing mirror. 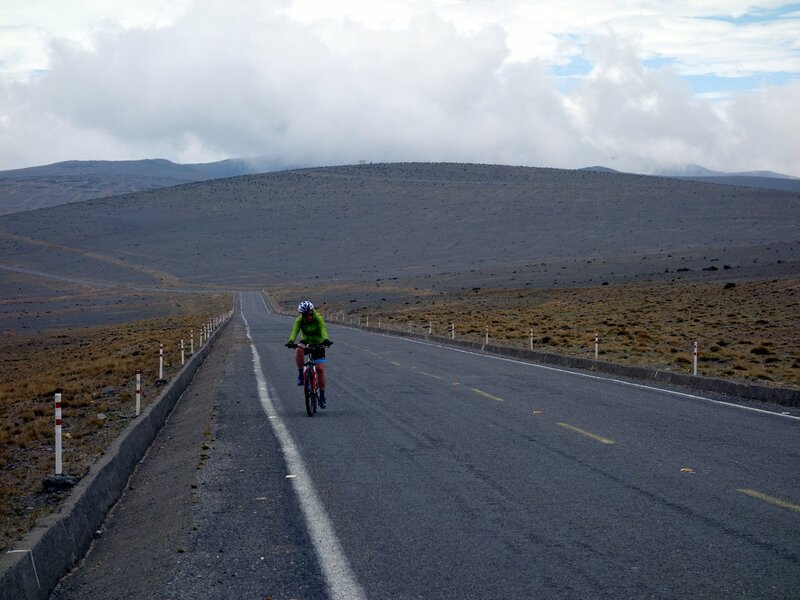 It took barely two hours for Edita to complete the rest of the cycle ride to Riobamba as we descended 1,500m on smooth roads. There was a long journey through traffic to get to our hotel. We expected a small town, but Riobamba turned out to be a big city. Pablo drove slowly behind Edita as she navigated her way across the busy roads. By the time we reached our pleasant courtyard hotel in a busy part of town, Edita had forgiven me for abandoning her. It had been my toughest day on a bike. The last two days had seen hope vanish into despair, and all because of a damn pizza. It had been 48 hours now and I was still nauseous, but I was happy that Edita had kept the sea to summit flag flying. The following morning I still had diarrhoea (not that you need to know all this), but I was happy to discover that the nausea was no longer as bad. We had only 20 or 30km of cycling left to go, and then I could get back on my feet. It was all uphill to Urbina at 3,600m, but it was such a short distance that I felt confident of getting back on the bike. We chose to take the Pan-American Highway because it was more direct, but this may have been a mistake. For most of the day we cycled on a two-lane highway, and the traffic fumes meant a return of my nausea. On the plus side it was another beautiful clear day, and the views of Chimborazo and its neighbour Carihuairazo were stunning. We could see both mountains all the way from Riobamba. 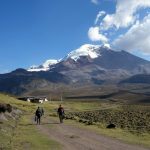 Chimborazo was at its most distinctive angle, with three clear summits lined up in diminishing size. It may have been only 20 or 30km, but it was another tough day for me as we made our way slowly up the hill and traffic hurtled past. I was still struggling to eat and the nausea gradually returned. It was a huge relief when we turned off the Pan-American Highway and cycled the remaining kilometre to the handsome train station at Urbina. 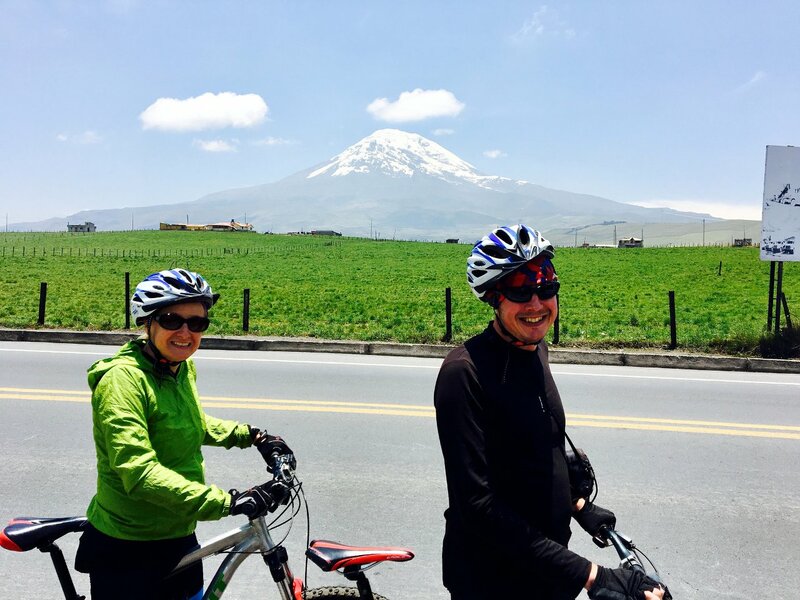 By then we had cycled all the way round to the east side of Chimborazo, and its shape had changed again to a single dome. In contrast to the desolate east side, over here the mountain was flanked in an apron of green and I was looking forward to trekking underneath it. I was so happy to get off my bike for the final time as I flopped into our guest house opposite the railway station. Chimborazo from the east side. We are happy to leave the Pan-American Highway (Photo: Edita Nichols). Many people have suggested that these two challenges might get me into cycling, but I can say with confidence that I will not miss cycling at all. It had been an interesting adventure, with many enjoyable moments, but good riddance to the bike. I certainly couldn’t say the same about Pablo, though. He bade us goodbye after lunch to return to Quito. We were lucky to have him with us, and we were sorry to see him go. We knew that it had been a team effort and he was an integral part of it. 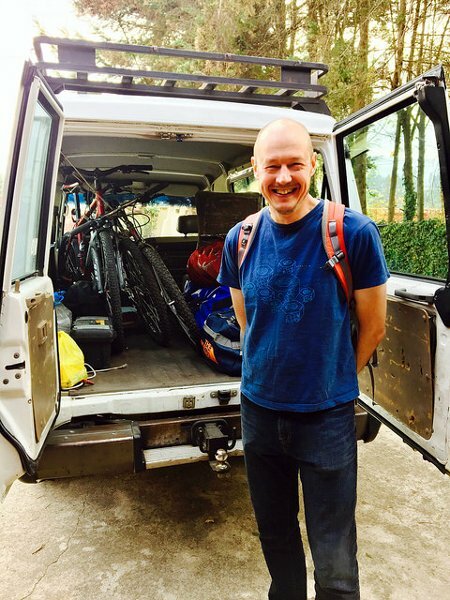 He had been a great fixer, and his knowledge of bikes and cycling was invaluable. 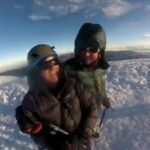 We knew that he had his eyes on a Chimborazo sea to summit challenge too. We didn’t know if it had ever been done before, but Pablo had already done it on Cotopaxi. If it was going to be a first, then he was more deserving than we were. In some ways we were his rivals, but he never looked upon us like that. He had done everything in his power to help us achieve our goal, and when he picked me up in the jeep his disappointment had been unmistakeable. And so ended the bike ride, but the sea to summit challenge was far from over. Glad you stopped it Mark before you got kidney failure. Yikes, I didn’t realise that was a possibility. Thanks for sharing this adventure. It looks so much fun. I want to go on a bike tour too.